She has been featured on the DIY Channel for a Pet Friendly Landscapes show and is a regular writer for the Cincinnati Dog Pages. Virginia is a veterinarian recommended dog trainer and has trained hundreds of pet dogs of all different breeds and as well as dogs for psychiatric service. She began her professional career in dog training in 2003, providing in-home training for the clients of the Stray Animal Adoption Program (SAAP), a 501(c)(3) foster care program that helps find homes for displaced animals. Through her experiences with SAAP, it quickly became apparent that the #1 reason dogs are given up, hands down, is a lack of or improper behavior training. And so began a passion to educate dogs and their owners! Virginia went on to mentor under Maureen May of 4 Paws Down and in 2007 received her professional dog training certification from the Animal Behavior College. She opened Unleashed Canine Obedience in July 2007 and has since received her advanced training certifications in the use of E-Touch™ and the ForceFree™ training methods for a variety of aggression issues in dogs and the implementation of the natural retrieve and forced-fetch at the International School for Dog Trainers with Martin Deeley in Montverde, Florida and Marc Goldberg of Chicagoland School for Dogs. She later went on to train with Robin MacFarlane of That’s My Dog! in Dubuque, IA and learned some amazing skills with more advanced obedience results. Robin’s exciting training methods have helped countless dogs and their owners create extraordinary bonds and mind-blowing training results. These techniques have added a remarkable proficiency to Virginia’s abilities to help her clients reach their training goals. In 2016, she took a course with Michael Ellis and learned motivational training skills that bring an exciting and fun flair to teaching basic obedience commands for both the owners and their dogs. Virginia Simpson studied Chad Mackin’s Pack to Basic’s program to learn how “to use a dog’s naturally strong social behavior to reduce stress and fear; build confidence and language skills and allowing for many common behavior problems to slip away.” She attended a 2nd seminar at Heather Beck’s K9 Lifeline with Chad Mackin at the 3D Workshop: Dealing with Difficult Dogs in 2011. Additionally, she holds a degree in Psychology from the University of Arkansas. Due to the ever changing landscape of dog training, Virginia continues her education in dog training techniques and dog behavior through seminars, collaboration with other trainers and workshops. 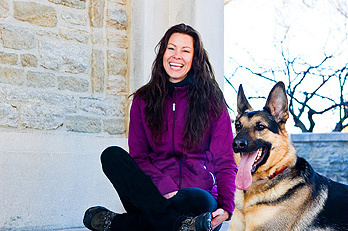 Virginia has spent thousands of hours working to incorporate a number of balanced training methods into her own personal techniques to help her clients enhance their relationships with their dogs.